N. What a nice letter. I have four N's today. Okay. I actually have three N's, but I don't like one of them so I used the SECOND word in the cow one to count as an 'N' I actually like. This is the one I really don't like. At all. Don't say anything nice about it because I know that would be a lie. 15 x 16. I like this one. It's all high gloss and rich looking in 'real life'. 9 x 16 One of the big phrases I remember from my childhood. 16 x 15. Look! It's a cow! See the word 'now'? That starts with an N. I painted all the lines on that cow with a liner brush. Mr. Jenny asked why I didn't just use a brown sharpie. Ummm... d'oh. Then it would be hand-sharpied and that doesn't sound nearly as cool as hand-painted, does it? I love this sign including the crooked letters. 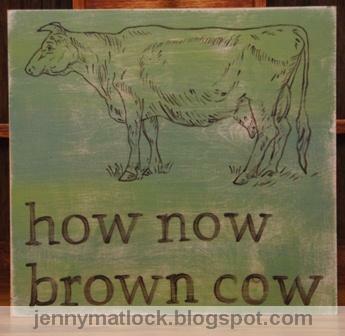 I think I was just exhausted from painting the cow! No stencils. No stickers. Handpainted with my own layout. To visit other links to the letter "N", just click here. Click here for my Etsy store. I tried to pick a favorite, but I love them all. Wowie, that is an excellent cow done free hand. You certainly are quite the artist. 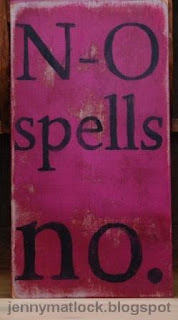 not your average sign painter =) I still think they are all great. These are great!! I love the cow! I love that cow sign! I thought you'd highlight No stencils! No stickers! YOU'RE PAINTING NOW? Good grief, Jenny. How many hours are the days on your planet? I want the never quit. Is it for sale? Awesome! You are an artist! I like all of them, but guess I love the messages of the middle two the best! These signs of yours are just plain cool. i like the cow "n", too! Wow Jenny I love them ALL!!! I am soooo happy with my signs! And I love your "N" signs!! Here is something for you to turn into a sign. "Assess Consequences" Did I spell those words right? 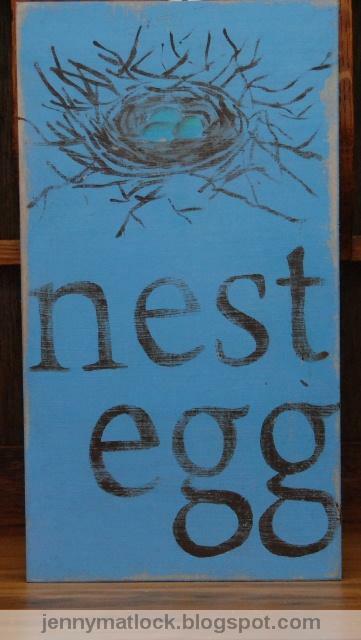 Anyway, this is a very useful sign that should be in everyone's home. It is something I want my children to always remember BEFORE they do something. Congrats on the etsy shop! You will be busy painting more and more signs! I like them all! yep, I do! 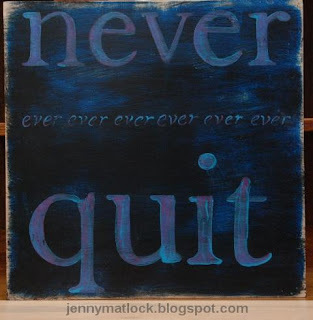 Besides the fact that they are all very nice I don't agree with "never quit" ! If you have an always boozed up husband or partner who beats you every day, I would certainly quit, lol ! ! I would also quit a restaurant if I had to wait 2 h to be served ! moooo....they just keep getting better each week! I love them all. You do great work. is the one that I covet! I like no spells no, we say NÉE. In Dutch . They are all nice, and unique! And, and, I'm not lying! Who ate my lip balm? Gosh! All kinds of stuff! Lead Free? ...and a GIVEAWAY! I'm trying to be sweeter.